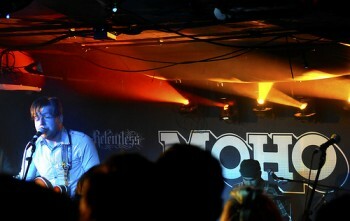 I descend the stairs at Moho, another blacked out Manchester basement venue. The crowd appears to typically represent the city’s indie population of trendy students and fun loving locals as it immediately becomes apparent that this will be a very Mancunian affair. The Reveres, a swaggering and intimidating version of The Courteeners, fail to create an atmosphere or much applause. Orchids are harmless in comparison and despite being more melodic, are more forgettable with their predictable lyrics. Delphic and The Whip are played during band changeovers until Clint Boon orders Florence and The Machine to shut up so he can introduce the headline act. Liam Frost cuts a slimmer figure and sports a less complicated hairdo than the days of his debut album ‘Show Me How The Spectres Dance’. Cameramen move into position and highlight the importance of this gig for him tonight. But the crowd is still restless and collective conversations blur the first few tunes into an undistinguishable whole. His voice is a mixture of Badly Drawn Boy and Johnny Bramwell from I Am Kloot and he resembles a younger Guy Garvey, hunched over the microphone. Liam states there will be an important announcement later, I’m thinking along the lines of an appearance by a singer that he has recently worked with. The harmonica is out, the crowd start to interact with the band and devoted fans mouth the words with eyes shut, which tell a poetic and dark story. The rest of the band leave the stage for a few requested tunes that are, to me, a lot more successful without the extra guitars and drums. ‘Try Try Try’ is communicated with as much emotion but to better effect because of the stripped down set up. I can finally feel myself getting into this gig. A few more beautiful sentimental folky blues solo numbers, including a new tune, have the audience entranced. The band return and the announcement is made… the drummer is getting married. I’m happy for him and everything, but was hoping Martha Wainwright would appear for the finale ‘Your Hand In Mine’. Although Martha-less, it proves to be an uplifting, stand out tune and justifies the presence of the other band members.